Spacious executive-level home on a hill-top site, with glorious views of the harbour entrance, Haulashore Island, Tasman Bay and the mountain ranges beyond. 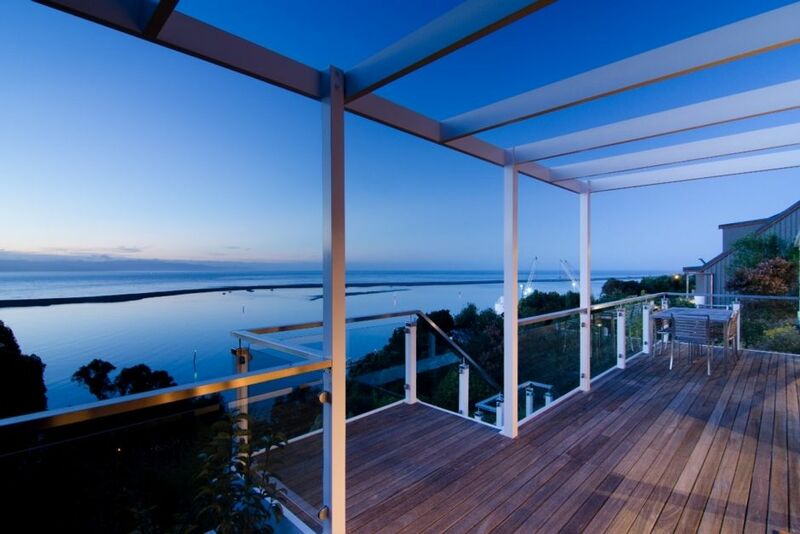 Sea Views has a stylish and contemporary decor of a high standard - a cut above your usual holiday home. There are 4 bedrooms configured as: 2 x queen, 1 twin single and a superking in the master bedroom. The master bedroom occupies the entire upper floor and has a large ensuite bathroom. Both bathroom have baths and discrete showers. * Extensive veranda is partially covered. The house and grounds are private. The sunny garden is fun to explore, via brick pathways. Check-out @ 10:30 unless arranged otherwise. No parties or events ('though may be suitable for management meetings). Truley is a cut above, above 'The Cut' (the name for the harbour entrance). Bathrooms include the toilets (they are not separate). Harbour, bay, Tasman Sea & mountain view. Full kitchen, very well equipped. Large well equipped house with views we did not want to leave. Extremely well appointed and luxurious house with fantastic sea views. We really enjoyed our six night's stay and are already looking forward to a return visit. We would highly recommend this property to other visitors. Very well equipped holiday home, great views and handy location. this is a fine property which gives the feeling of being right at home, Great view, wonderful kitchen and lovely garden. Nelson city is 2km away. The waterfront dining “strip” is a short distance away. Able Tasman National Park is easily done as a day-trip.